Photographed by Robert Shantz at Cochise Stronghold, Little Dragoon Mts., Arizona, 21 Sept. 2004. 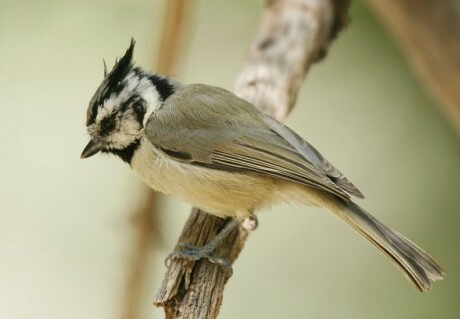 Bridled Titmouse is a small, very active bird, with a distinct head crest and bold black-and-white facial pattern. These year-round inhabitants of the middle and upper elevations of sycamore gallery woodlands glean small insects and spiders from foliage and bark crevices. They also eat fruit and softer seeds. Sycamores are very prone to developing holes either from broken-off branches or excavations by woodpeckers - which are avidly used by nesting titmice. These birds also forage and nest in other tree species in the sycamore woodlands and range as well into oak-dominated woodlands.